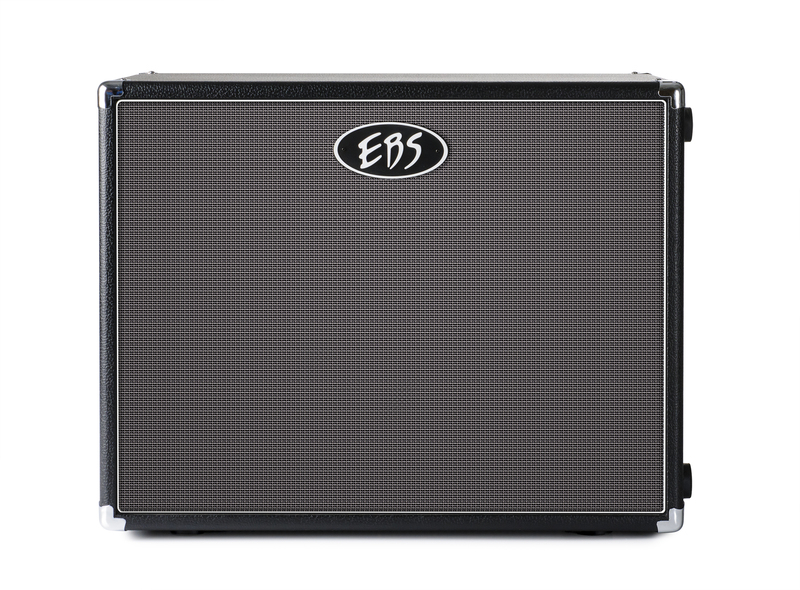 EBS facelift on ClassicLine cabinets and Session combos. EBS ClassicLine 210 with the new front cloth. New front grille cloth with better airflow to improve sound quality and reduce vibrations. heavy-duty, removable casters with the 410 and 212 models, heavy-duty protective steel corners and heavy-duty wheels on the 810 model. Recessed ‘lock-in-place’ steel cups matching the footprint of the EBS CL500 amp on the 410, 212 and 810 models. New corners and “lock-in-place” cups matching footprint of the EBS CL500 amp on the 212, 410 and 810 models. All EBS Session combos, the Session 30, Session 60 and Award Winning Session 120 will also feature the new front cloth from NAMM Show. Visit www.ebssweden.com for further info (update after NAMM). 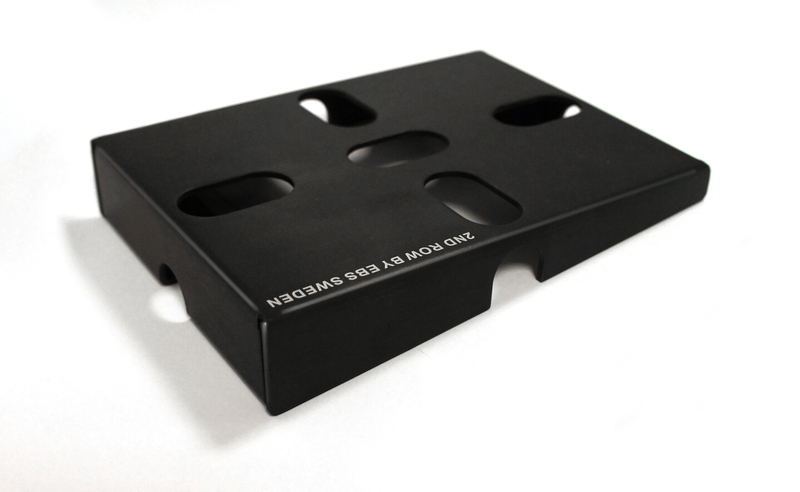 EBS Expand the line of Pedal Board Accessories with the new 2ND ROW pedal board riser. EBS 2ND ROW pedal riser in lightweight but sturdy Aluminium. 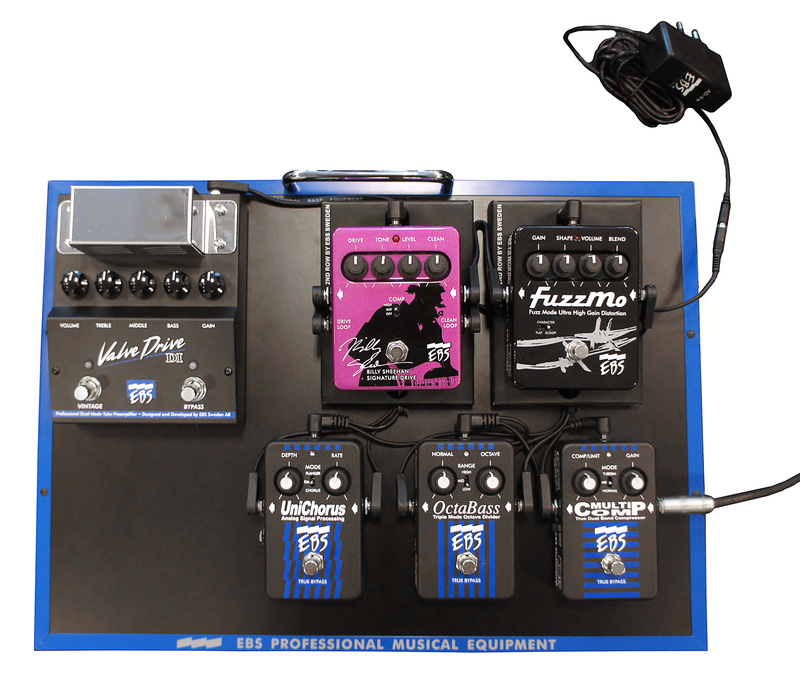 After experience great success with the flat designed PCF patch cables, introduced at the NAMM Show 2014, EBS now expand the line of pedal board accessories with yet another great design, the universal 2nd ROW pedal board riser. The 2nd ROW can be used to place the ‘second row’ of pedals on your pedalboard up a level and in a comfortable angle to make it easier to access and to reduce the risk of stepping on the wrong switch when engaging your effects. It can also be mounted below the entire pedal board (require 2 pcs of 2nd ROW units), to angle the whole pedal board. 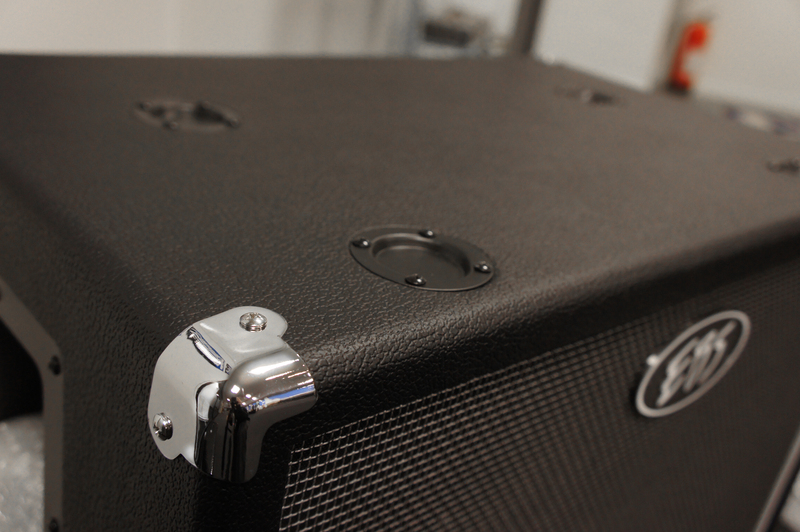 The clever design allows you to hide loose cable inside the 2nd ROW to keep a neat and clean look of your pedal board. 2nd ROW can be attached to any pedal board using 3M DualLock or Velcro. The EBS 2ND Row in use on the CarryOn pedalboard hooked up with EBS PCF flat patch cables, ICY-30 insert cables (for the loops on the Billy Sheehan Drive) and AD-9+ DC power supply. From now on, the EBS CarryOn pedal board with bag will include 2 pcs of the 2ND ROW, replacing the previously included angled rubber pads. Estimated price on the 2ND ROW riser is $20 each. 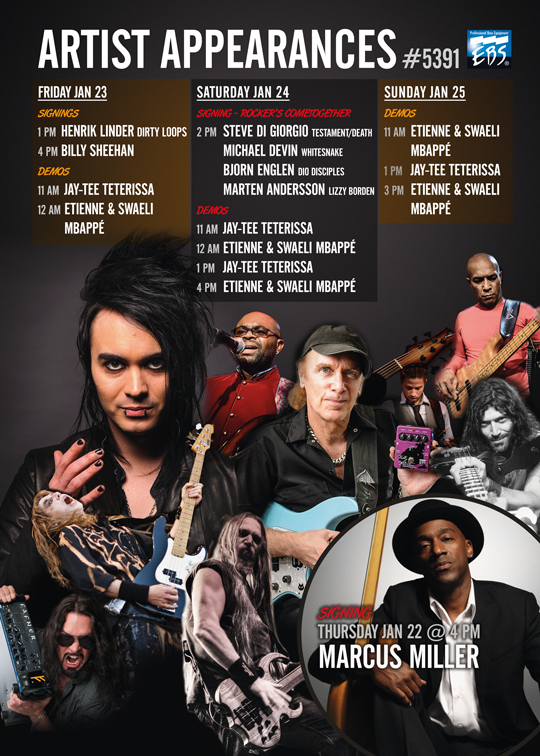 Artist Appearances at EBS booth 5391 at NAMM 2015. Signing with Dirty Loops Henrik Linder, who won Bass Player Magazines ‘Young Gun Award 2014’. Rocker’s Cometogether with Michael Devin (Whitesnake), Steve Di Giorgio (Testament/Death), Bjorn Englen (Dio Disciples) and Marten Andersson (Lizzy Borden). Demo appearances by Etienne Mbappé (John McLaughlin’s bass player), Swaeli Mbappé (the amazingly talented son of Etienne) and Jay-Tee Teterissa with guests. Scheduled at EBS website, www.ebssweden.com and in the NAMM Exhibitor’s Events calendar in the official Namm app. Additional artist appearances may be announced later. Stay tuned. Press releases and images will also appear on the EBS Press section www.ebssweden.com/content/press.php from day 1 at the NAMM Show. This entry was posted in EBS Sweden AB - Press Center and tagged amps, bass, cabinets, EBS, namm, namm show 2015, news, press on January 22, 2015 by ebssweden.